Experience, smoother, softer skin with Hydrea London's Exfoliating Stretch Cloth & Gloves Duo Set. 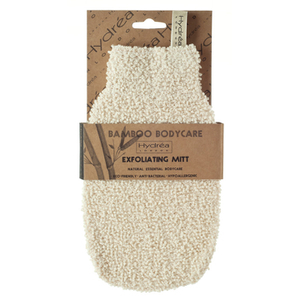 Made from natural cotton with firm nylon loops, both products are breathable and antibacterial, and work to gently buff and exfoliate your skin to reveal natural radiance. The gloves are 'one size fits all' and expand when wet; they allow you to exfoliate hard to reach areas and contours for smooth skin, all over. The stretch cloth helps eliminate dead surface cells for soft, rejuvenated, glowing skin. FSC® (Forest Stewardship Council) certified.